What would trump think about Kong Kong football fans booing the Chinese anthem? Unless you follow American football, you may not have been aware of a strange form of protest taking place before the games. Some players have chosen to kneel, link arms or remain in their locker rooms, during the playing of the US national anthem, as a symbolic way to draw attention to the police killings of unarmed African-American men. The protest was given new momentum after remonstrations from President Donald Trump, who apparently is more worked up over black football players kneeling before the flag than about white supremacists marching with swastikas. Trump told a boisterous rally in Alabama that players who knelt during the anthem should be fired, and he urged a public boycott of teams that disrespected the anthem – prompting more players to opt for a show of defiance. What would Trump think about the scene here in Hong Kong in recent days, where hundreds of local soccer fans booed and turned their backs during the playing of the Chinese national anthem, March of the Volunteers? He would probably side with China’s Communist Party rulers, who this month decided to make insulting the national anthem a criminal offence, punishable by up to 15 days in jail. Hong Kong has yet to follow through with its own legislation specifying what conduct might be considered an insult to the anthem. Booing is certainly likely to be considered an unacceptable affront. One lawmaker questioned whether moving, blinking or looking around during the anthem might get the fidgety offender hauled off to the pokey. Is taking a knee really an offence? The American football players involved in the US protest said kneeling was actually a reverential gesture, with the body resembling a flag flown at half-mast. I personally dislike the pre-game protests that target The Star Spangled Banner, even while I think the underlying cause – racial injustice and police brutality against black men in America – desperately needs the spotlight of public attention. But while I disagree with the players’ form of protest, I still vigorously and enthusiastically defend their right to do it. First, sports figures, like actors and musicians, have long used their celebrity to draw attention to political and social causes, despite Trump’s admonition that millionaire athletes should just shut up, play the game and check their first amendment rights at the stadium gate. 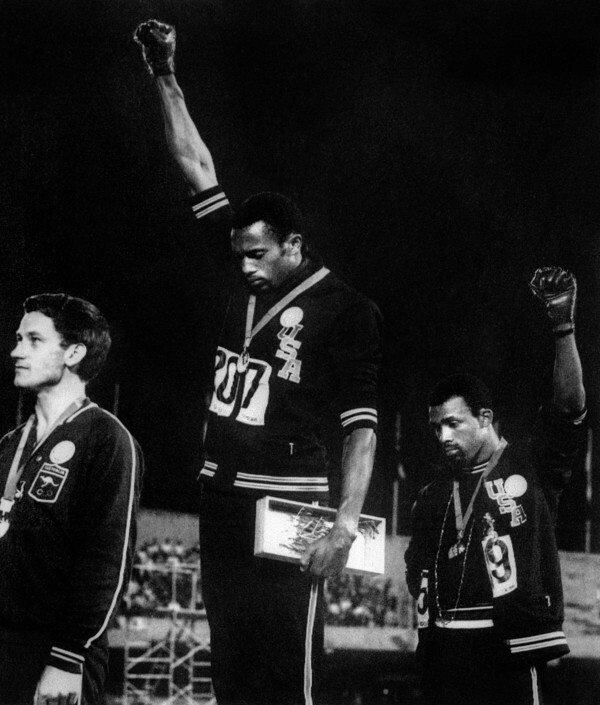 I remember as a 10-year-old kid in Detroit feeling a mix of astonishment and pride when athletes Tommie Smith and John Carlos raised their gloved fists into a “Black Power” salute while receiving their gold and bronze medals at the 1968 Summer Olympics in Mexico City. Some clearly find any protest against the anthem or the flag distasteful – unpatriotic, it is called, and disrespectful to the men and women who sacrificed their lives for our freedoms. But I see it exactly the opposite; those who fought and died for the country did so to defend our freedoms, and that includes our freedom to speak out, protest, march in a rally, burn a flag, and even to take a knee or turn a back during the playing of the national anthem. To me, freedom of speech means nothing if I will only defend the forms of speech and expression I agree with, and try to suppress the speech I detest. As a black American, whose parents fled the racism of the south in the 1940s, I was disgusted watching the neo-Nazis and white supremacists marching and spewing their hate in Charlottesville, Virginia last August. But as an American who believes free speech is one of our core principles, I defend those white supremacists’ right to march. That brings us back to Hong Kong. The territory’s Basic Law, often called its “mini-constitution”, says “Hong Kong residents shall have freedom of speech, of the press and of publication.” That’s a pretty emphatic statement of a right, without any qualifiers. Of course free speech is always limited, even in the countries that most respect it. Different countries decide where to draw the line. In France, denying the Holocaust is a crime. Canada and some of the Scandinavian countries prohibit hate speech. In Indonesia, the popular Christian Chinese governor of Jakarta, Basuki Tjahaja Purnama, was convicted of “blasphemy” and sentenced to two years in prison for reciting a verse from the Koran that his political opponents said defiled the holy book. And in the US, with perhaps the broadest definition of free expression, threatening to kill the president, or joking about a bomb in an airport, is likely to bring an arrest, prosecution and jail time. Here in Hong Kong, some at the top seem to want to strangle any talk of Hong Kong independence as a necessary restriction on free speech. Booing or otherwise disrespecting March of the Volunteers seems another likely target for those who want to stamp out open expression. To me, measures like these miss the point in that they try to enforce a sense of patriotism that some young Hongkongers simply do not feel. People want to burn a flag, boo or take a knee during the playing of the national anthem, precisely because these are jarring gestures designed to cause offence – and draw attention to a cause or concern that might go unnoticed with a less flamboyant form of protest. If you want to see more banners and graffiti advocating Hong Kong independence, the quickest way is to tell people that the mere expression of such a thought is banned. If only Nixon could go to China, only Trump to North Korea? As distasteful as it seems, those Hong Kong young people booing the anthem and posting their pro-independence banners have every right to do so. You may not like it, just like I dislike seeing those kneeling American football players. But it’s a right worth fighting to maintain, before it, too, disappears.